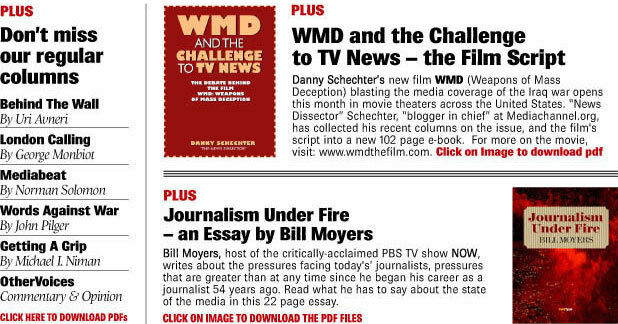 Join our mailing list now and and we'll give you our special end-of-year gift to ColdType subscribers, a FREE copy of Danny Schechter's 300-page e-book, Embedded: Weapons Of Mass Deception, which normally costs $US15 to download. What are the catches? None. ColdType has no membership fees or charges of any kind. We'll never ask you for cash and we won't sell your name to any other list. But we will tell you when new stuff is going on line and we'll make sure you're first in line for more exciting freebies in the new year.